JACQUELINE FREEMAN is a pioneer in the emerging field of natural beekeeping. A biodynamic farmer, she is gifted in perceiving nature intelligences, particularly honeybees, and has spent many years working alongside them with an open and prayerful heart. Her work with the bees has uncovered how bees fulfill broader roles in the hive and in nature. JACQUELINE teaches bee classes at her farm and honeybee sanctuary in Washington state. The documentary movie “Queen of the Sun” showed her caring work as a gentle swarm rescuer. Her bee articles appear in national magazines and anthologies. She is a featured speaker at conferences for organic and treatment-free beekeeping, permaculture and sustainable agricultural. Our farm is located in the tiny village (pop. 2000) of Venersborg in southwest Washington. We have beef and dairy cows, dairy goats, layers and broiler chickens, seasonal turkeys and many honey bees. The farm is a bee sanctuary with native pollinator hedgerows and blooming bee pastures. We grow a dozen kinds of apples, grapes, berries and other fruit. We’ve got a vegetable garden and two greenhouses so we can grow food year round. We grow and bale our own hay and always have a construction project going. Living on a working farm is a real pleasure and even when the work is hard, we feel blessed to be in partnership with this land. We work with joyful hearts and open minds in gratitude for the many lessons our good farm teaches. So wonderful to hear Hunter is the one who connected us. Farming for 15 years, bought our 100 year old farm 15 years ago. Were second owners, it’s always been organic, and it was because of frugality more then a political action. Then we came in, we did not intend to become farmers, at all, that was not the direction we intended to go in at all. My husband works with horses, and I run a school for people who want to work with horses. And you know chickens are the gateway animal on a farm! I’d wake up in the morning and say, cows in the field and cows in the barn? And so we went out and got a cow, and she became the mother to many. At the maximum we had 8. My husband just came in from milking her right now. We have seasonal animals like the turkeys, and dairy goats and my bees have turned into hundreds and thousands of honeybees. Wow! That’s quite the introduction. Now do you have horses? Now isn’t that funny? That’s the one animal we don’t have. When we teach people to work with horses, my husband works with them all the time, and when you teach people to work with horses, we teach people with fresh horses. That’s the reason we don’t have them here. I grew up with horses, I probably have a 30 year background with horses. But we decided not to have them here because for students, it’s actually better to always have new horses so they can tell the effect of their work. I don’t know anything about horses. I guess, you’re training, breaking a new horse? He does a kind of work called structural integration, on horses, and teachers people how to do it as a career. His school is called the Equine Natural Movement School. And that’s what it does, it brings horses back into balance and structure and they become more fluid in their movement and it’s easier for them to be healthy and strong and stable and sturdy. If someone shows, their horses, it helps with the grace of their movement. I do usually start the show asking about your very first gardening experience. Were you a kid or an adult, who were you with, what did you grow? Gosh, I never had a garden when I was little. I didn’t, I lived in the country. I had ponies…. I was a little girl and I had ponies, and that’s what I was completely wrapped up. One time I planted radishes. I was so surprised that they grew at all. That was kind of an experience. We lived up in the outskirts of Seattle for a few years, we started having gardens there and that was kind of fun. Here we put up some raised beds, we went to the local store where you can get compost soil. We had some clayish soil and we were supplementing it, we built this raised beds. We planted our food, and kind of forgot about it, but then things started coming up in half the beds, and yellow and curled and obviously, very damaged. And we went what the heck is that? Why is it those beds? and not in these beds? And then an article came out. a lot of the golf courses take their clippings to be made into compost, it’s just a place where you can bring your branches, and leaves and grass clipping and they turn them into compost… they sell the soil, compost, three way soil. It turned out there was a chemical that the golf course that doesn’t have a short half life, it had a 2 year break down period! So when that refuse was broke down into compostable material, the chemicals the toxic chemicals in it were still active. So we had picked up a truck full of contaminated soil/ It was a heart breaker and there farms who were organic around her and they lost their certification and now they had toxic chemicals on their stories and they had to go back and start all over from the beginning! I was furious! Wait a minute I’m growing stuff in my backyard! We need to be really on top of this. How can we trust what we’re buying in the store? Up until then we had bought conventional food without even thinking about it. From that point on everything I bought, if I pick up something that it has 98% I’m like what’s in the 2%? Toxic chemicals?! It’s got to sit there for 2 full years because it’s clean… compost can dismantle a lot of chemicals, when something has that long of a half life … you have to wait it out, mother nature is brilliant about how to dismantle things. We’re also biodynamic by the way, a few years after we started being organic, we got into permaculture and loved that and then maybe 2 years after that we started getting into being biodynamic. We have cows. I read that a cow makes 80 lbs of manure a day! And I can believe that. 80-100 lbs depending on the size of the cow. So we make a great deal of compost! I had some women who were interning with us, I said lets spread some compost over it, I have this truck load here. it found every single flower seed in the soil. It was like some of these seeds probably been waiting 40 years to have something nurturing come and find them. It was so beautiful we had evening primrose, and asters, all kinds of beautiful flowers, all along this stripe going down the middle of the house. red clay scar with almost nothing growing on it. when you put that dirt in that ditch you don’t have that layer of top soil there anymore. it’s good soil with lots of minerals, it’s not loamy and rich like the bottom land is that is down form us. started by Rudolph Steiner who was a scientist and a philosopher. The thing that appealed to me about it is, the approach that we have on the farm, this goes if you have a backyard or a little house you treat everything as if it was a living breathing entity. I did something biodynamic, I was dreaming about cows. And I was wondering about that, its the farm telling us we should have cows here again. That’s reaction is kind of what you do in biodynamics. How do you respect your land? How do you act in concordance with it? How do you bring this land to its’ fullest expression of life and vitality? Like bringing the cows, to making the compost to … you treat it in love and with respect and you are always respectful of the spirit of everything. It makes it so much fun to interact with the life on the farm in that manner. My husband is like that with animals on the farm, he has such a tremendous respect for what their needs are. How to interact with them that your are always honoring the life spirit in that animal? Now Rudolph Steiner is from the Waldorf schools right? He started Waldorf schools, he had the first concept for the first CSA’s for people who didn’t have gardens in their backyards, so they would participate with the famers gardening …. with their hands a little bit, and they would have more of an understanding of how their food was, it was more participatory, some CSAs still do that, they will have a farm day, where everyone comes out, others are more where the works is done and you just trust that it’s being done well, you don’t really get your fingers dirty. He was just amazing, anthropocropic medicine, eureitimie … just really brilliant, different kinds of psychotherapy, everything he looked at he seemed to have animate understanding of the harmony in all of life he worked to bring that out … biodynamic agriculture was something that came along from working along side farmers that were not being as productive as they could be. Just as a coincidence I grew up when my mom’s backyard backed up against a Waldorf school, and there was the school and then the soccer field with a d a track around it and then it was surrounded by a nature trail, and I think that always influenced my life having that school and nature trail back there. There was like a grape thing/arbor that was cool. Kids who are at Waldorf schools, are taught to have a relationship with nature, which is just complexity missing, although Michelle Obama is doing a good job with inner city schools growing food so kids know that a carrot comes out of the ground. I know you’d be surprised even here in Montana where kids live on ranches and things you wouldn’t think kids wouldn’t know but they think carrots come form the grocery store or something. Yeah and they’re surprised it has contact with dirt! I know I’ve brought in carrots form the garden for a surprise snack and the kids are like my carrots dirty I have to wash it. Just fun! So do you want to tell us how you got started with the bees? Yeah, I’ve had bees now, I think this is my 13th year. I didn’t know anything… all I could tell you was honey that came out of the hive, and if they got upset they stung. Probably i could have told you with 20 seconds what I knew about them. I kind of thought they were gonna attack me, over time I I realized they didn’t care about me one bit, the more I sat there and they would come sit on my sleeve, they would come look and right form the start I became aware of their gentle behavior … You know we fall prey to what media … swarms of bees will come and attack, good lord it’s not like that at all … my first bees were fairly feral, they’d been out on their own for many years, right from the start I’ve always collected wild swarms. There nice, the nice thing about those bees they haven’t been treated with chemicals. Worry about their bees getting mites, which beekeepers do. Those bees are so delicate, if you treat your bees it can cause bee damage for 5 generations past that original colony you treated and that’s only because the study only went 5 gens. I’m so glad you brought at up beaus I’ve been worried about these mites and everyone keeps telling me we have to do something about these mites. And he watched this video that said you could put powder sugar on them? We don’t even have to do that? COOL!!! Let me tell you, there is a sequence on this, btw that’s an organic treatment. The powder sugar makes them groom themselves, and they’re like little fleas and so then they’ll groom them off, that’s the theory … they hate that stuff! I have this concept that I follow, that mother nature the way she works in the world, that the strongest one survive and the others die. The queen bee can breed with 20 different daddies, that gives the hive a wide variety of traits in the babies that will allow them to respond to nature’s different situations. So if part of the bees in that hive, and you have a drought, and there are bees with a daddy with drought behavior, those bees they’ll say don’t worry we know exactly what to do! and lets take that out of the gene pool, so when you start out with bees, theres a good chance your bees won’t survive. It was heartbreaking for me, but I was committed. starving to death, that’s a different thing. So you don’t worry about those veroa mites being spread? Well how are you bees doing? Oh our bees are fine! They stopped using the chemicals and their bees became stronger. how many mites they can handle. It wouldn’t be unusual to see in a treatment-free beekeepers yard, that they have some mites, some mites, they just don’t have weak bees, theres a small amount of mite they can actually deal with it. I had that happen in our bee yard a few times now, and I trust it. Every once in a while a hive says its too much for us, we can’t handle it and they go down and they die. . The majority of them come out the other side and they come out the other side stronger bees. The other thing I was worried about is that I just didn’t like the way they even figured out, how they count the mites thing … I mean it seemed like you had to kill a bunch of bees to see if they had mites? during this time in February, there are about, I think it’s about 80% of the bees in the US are in the almond fields. when mites first came to US it was to FL 15 years ago. Anyone who had conventional bees in citrus trees in FL, and took them to all states. At the end of that one year there were mites in all of the 48 states. You couldn’t have designed a system better to carry that stuff all over to California. That’s crazy! That its come down to it. So basically we don’t worry about the mites, and if they survive they survive but if our bees die we have to get more bees. The key to that is not to buy packaged bees. If you’re gonna get started get your bees form somebody you know, who does good organic healthy bee care. We have people who are around us, who do nooks of bees with queens or people who catch swarms and will catch a swarm for somebody. So that’s how we start them out not doing part of that artificial insemination. We would have started a long time ago if we could have found someone. you can’t just put bees in the backyard and then say go to my neighbors to get your feed. Or water. one of the first guys I talked to said we were too far from the creek and he wouldn’t put bees on our property becasue we we’re too far form the quick. may be your neighbors swimming pool. That’s what I did, my neighbor said, you must have bees, and I said how do you know? Do you want to tell listeners? What a water station is? for birds you would leave that whole thing open water. Bees need a place they can drink the water. The easiest thing is to fill it with gravel half way so there are mounds of gravel they can land on and walk down. and stick their long little tongue down there and get a drink of water. local insects are coming for their water needs, and they are just gorgeous and beautiful to look at! We have this creek bed that mike built down to a pond, and it grew a bunch of moss and that’s where the bees totally hang out. If ou have moving water. Yes it’s supposed to recirculate! we have stock tanks because we have cows. And I knoteiced in the stock tanks, the bees were trying to drink out of that, I put sticks in there floating sticks. And oe day I was watching and I realized I saw one bee trying to get a drink and they were doing like log rolling and now I have fork sticks, and my husband says doe we have to have all theses sticks in the water? Oh the fork makes it not roll. The other thing I told mike were’e gonna plant more chives this year, because I know the first thing they go to is the chives. What about bumble bees because they are there a lot. bumble bees have longer tongue, size will help them pollinate different. these plants that you grow in your garden as vegetables, you will not believe how beautiful how they are as flowers. I grew, this is more like a radish seed fell somewhere and grew on it’s own! It was 4 feet tall, almost 5 feet wide, and covered in white flowers every day! People would come in and say what kind of flowering bush is that ? If you let elute grow, it will have these beautiful blue flowers, it’s a member of the chickory family. And these radish flowers and lettuce flowers and the bees love them! They will bloom and bloom until the frost kills them back! blue flowering bush, will go to frost! That’s a lot of bang for your buck! We let a lot of things go last year, because we have been learning a lot about seed saving. What’s your favorite activity to do in the garden? I’ve named it, oh I’m a farmer who mulches with weeds! I don’t necessarily pull them up, I just let them grow alongside, it’s kind of a permaculture concept, that’s what I can call it… but I just have a curiosity where I say lets see how you do right here? Sometimes they overtake an area and I pull some things out, but for the most part. this is between my husband and I, we have things like thistle, when it’s seed it’s a great bird food. But Thistles when it blooms it’s a beautiful flower that bees totally love! It’s really healthy for them. we have this ongoing thing, I say no, no, no just let them flower first, I say just let them go. I let them go till the last possible second. Isn’t there something about a weed is only something growing where you don’t want them to. So I just say let those daises grow. I want them there. we aren’t often aware what the task of the weed is or we would be praising them and saying more over here. I wonder if I can come up with a good use for spotted knap weed. Spotted knapweed was why Montana was the whole bee growing in the place. It’s a wonderful flower for bees… Yes, I had a friend who was from Tennessee was going to retire into Montana and do his bees up there. He went out there a couple of years ago, and he said the beekeepers were in lament, that everyone was doing such a good job on spotted knapweed. I was just said we should plant something else here where the knapweed grows over by the bees. 3 sisters thing, where the beans are growing up and the squash and on a grand scale! everything mingled together and I do it again and again! I do it year after year! Lets me spread everything! take down big areas, when haying, can take down the edges! You know where I’ll be like, no,no honey! I’ll do that, and he’ll say, nano honey I’lld do that! Im gonna get one? I wonder how come we don’t have one? 10 different tasks that you can do with it. We felt the same way, why have we not got one before? I’m thinking that maybe the hori, hori is knife, knife is because it, isn’t it like 2 different types of knives like a seated edge on one side? A lot of my guests have recommended that. I think I could live on sauté a bunch of garlic, and a little bit of olive oil, and throw in about 9 pounds of kale, me on a desert island, I can only take one food, that would be it! I can go out right now and pick, even in January, the bitter lettuces, cress and kale, and even the beet greens, make it right through the winter. That’s why you moved from New england? being on Facebook! Brings us all together that are just wonderful. I’m on a number of groups like-treatment free beekeeping! Different aspects of things in our life. My farm-gals group – we formed a buy in group! We buy stuff in bulk, and we buy big stuff in bulk, and my husband needed t-posts! We needed to buy t-posts! everyone in my buying group! 85% of what I buy, I buy through my farm gals group! I would encourage others to set them up! go to a supplier and say if we buy it in 5 gallon buckets, how many do we have to buy to get it at a wholesale price? We just did nuts we do a bulk buy, pecans and hazelnuts, and walnuts, we bought them all at heavy discount! That’s got to be one of the best internet resource! My husband’s a baker we spend a lot of money on walnuts! And turbinado sugar is another one! Everything we buy is organic! So that takes off the thought that the cost of organic is too expensive. when I go to pick stuff up, someone will say I’ll go pick up mine I’ll drop mine off for you. And today is International Women’s Day! I walked through and said wow what an amazing group of friends we have! we do a bee keeping conference every summer in August, and I had some people who were tenting. And they needed breakfast and she made them breakfast, but she told me what a difference it made for income and such a little thing! I was gonna say when you go to pick the stuff up it’s like a great little get together and a chance to see each other because you need to go to that thing! For me I know it’s always I see the people more who are on Facebook! We go for a walk or play tennis! my farm gals are going to buy it, I’m never gonna get past my driveway. who wants it! we’ve kind of created our own economy that way! I think listeners are gonna love this! Well, I kind of I read Secrets of the Soil. That book was out.. gave it to our interns… when we had our apprentices on the farm that was assigned reading! You need to know many different ways and you’ll see why does music make a difference to your plants, it really expanded people horizons so I would recommend that too. We read Mother Earth News, Countryside subscription …. they are steady in our house. I also like Ode and Yes magazines because they are so positive about things going on in the world … open up what’s new in the world … you think oh? we’re going down to hell in a hand basket … let’s all go where we build community and we’re making good things happen in the world. I have heard about Yes and Mother Earth News, but I have n’t heard about those others Ode and Countryside. The Name of it is The Song of Increase: Returning to Our Sacred Partnership with Honeybees. That’s what I write about. It has stuff about how I learned stuff form them … someone who is an open minded bee keeper. If your very conventional and only do what science tells you, my book probably isn’t your cup of tea but if you want to know what the bees think. And how to look at it form their perspective, my book is out right now on amazon. It was just picked up by a publisher, because sales have been consistently, on Amazon’s top 100 list in 2-3 categories every day. So it caught the idea by a publisher, when you do that, I have to take it out off the market. It’s absolutely wonderful, sounds true, because it caught their eye, I hadn’t been marketing it to book stores, it will start to come out in Barnes and Noble and stores in the fall and for them it’s a brand book! I send out a little video and picture and whatever we’re doing with our bees this month. I’m always happy to have people come out and see! My favorite charity is xerces.org they do lots of work with pollinators and trying to get poisons taken out of mthe environments. rather then have them buy some crappy thing, or broadleaf weed killer. I want to kill the clover. I said why do you want to get rid of the clover, it’s a nitrogen fixer, it makes your lawn healthy? You just have to orient our thinking a little. I thought I was not supposed to have clover, because that’s what the chemical companies tell them. Broadleaf weed killer, what a stupid thing to get rid of the clover in your lawn. I try to be as friendly and helpful as possible, looking like just another person who’s looking at that same wall, and try to educate people that the problem you have some weed or something is that the weed is trying to do a task, if it’s trying to bring calcium to your lawn maybe you can help it with that. Now if the problem is you have some kind of bug eating your food, or aphid is eating your lettuce or something, the aphid is actually eating weak plants, that’s ow mother nature gets rid of plants, if she wants to get rid of for the next generation, mother nature sends in bugs or pests to knock down what ever is week. if we could just tell more people that, it would kill the whole chemical sparing industry, it isn’t at you need to spray poisons on your plant, you need to give it better nutrition in the soil and then the plant will be healthy! I had a neighbor said who said to me, aren’t the aphids absolutely terrible this year? They are everywhere, and her garden is 200 feet form my garden and I didn’t have an aphid in there?! So I went over there and I said, let me help you with your soil, you need some compost, I;ll bring over a wheelbarrow full of compost, and well get this soil in better shape! That’s the difference between weak soil, it isnt’ gonna have the, Mother Nature doesn’t want that plant to go to seed, and donate its seed into the gene pool, and so it needs to get pulled out, that’s the job that the diseases! What a good job their doing! Yeah! Go pests! Go diseases! Go knock down that weak stuff! Yeah, it’s a radical approach! 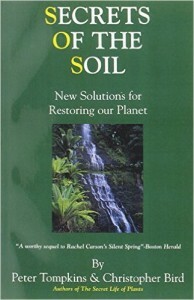 But that’s a great theme, so many of my guests have talked about it’s all about the soil. That’s crazy, I was trying to get rid of the clover! Oh just love Mother Nature fall in love with Mother Nature and everything will be just fine! The whole world changes. Spiritbee.com is my website. and sign up for the newsletter and then you are connected to us, you’ll see all the things we’er doing. My granddaughter finds all the bird nests on our road! People who have that vision, I am so impressed by them. We were having this class, and we were standing around and this women looks up in the pine, I was showing them something about the bees, and she said, “oh look you have 2 barn owls up there!” I couldn’t believe that I had seen them before?! I find that fascinating that she has that bird nest vision. I don’t see them as much as she does, by any means, but I walk up that road all the time, now she’s a track star so she runs up and down it more! I knew you were gonna be a great guest! Last year my earth day episode was Heather Wood who has a natural bee sanctuary in Olympia Washington! Since w’re talking on International Women’s Day, I’ll try to get it up! I’ll try to get it up on Thursday, but I’ll try for this weekend for sure! Thanks, smooch because Mike and I have been going back and forth about the bees. We’re not spreading Mites to other peoples bees? Well you mite be, but the more of us who can get on the other side and stop importing, those bees from other places and get on the organic side!